A great HDTV for under $300? Low price doesn't mean low quality anymore when it comes to TVs. Prices have come down to where you can get a quality HDTV with smart TV features like integrated Roku to watch Netflix, Hulu, Amazon Prime, YouTube and more. If you're on a tight budget or looking for a TV for a smaller space like a dorm, RV, or for a children's bedroom or play room, we've got a great pick for you. 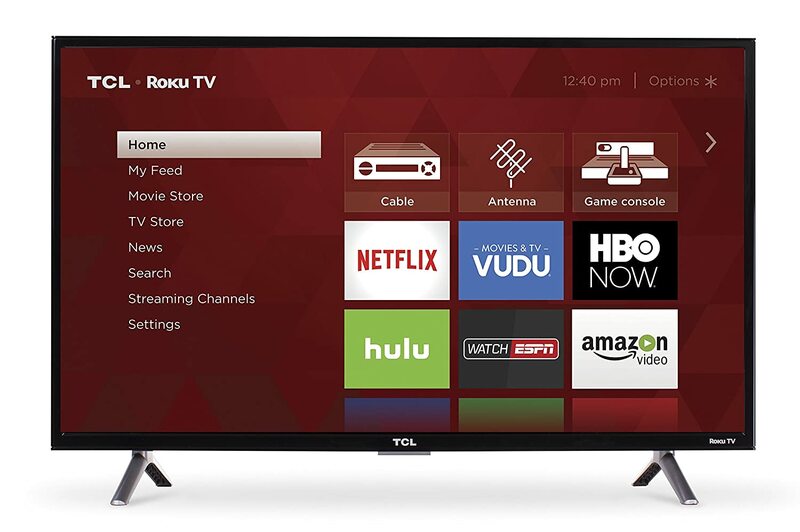 TCL is currently our favorite brand for high quality HDTVs in the lower price categories... and for good reason. This 40 LED TV has a 120Hz refresh rate for smoother, clearer video (good for things like sports), built in WiFi, and integrated Roku TV. Roku gives you access to over 4,000 channels of internet streamed content from Netflix, Amazon Prime, Hulu, HBO Now, YouTube, and more. The direct-lit LED screen is full 1080p resolution which is great on a screen of this size. The colors are rich and the contrast is excellent for a TV in this price range. The remote is easy to use and you can even download an app to your smartphone to control the TV through the app's interface or with voice commands. Another nice feature is you can plug a USB thumb drive into the back and use it to pause live TV for up to 90 minutes. It only supports up to a 16GB drive so it's inexpensive to add this functionality if it's something you're interested in. 3 HDMI(1 w / ARC), 1 USB, RF, Composite, Headphone Jack, Optical Audio Out is a solid assortment of input/output ports and should accomodate most entertainment setups. You really can't beat This TCL if you're budget is under $300 or you need a smaller TV without high end features like 4K resolution or HDR.